Spank Industries, distributed in Canada by Live to Play Sports, is proud to partner with the world's largest mountain bike festival for a second year to bring you the Crankworx Whip-Off Championships. This year, riders from around the world will compete for the Oceania, European, and Official World Whip-Off Champs in Rotorua, New Zealand, Les Deux Alpes, France and in the Canadian hometown of Crankworx, Whistler, with more prize money than ever before on the line. Photographer Sven Martin started the Whip-Off Champs in 2012 as an underground contest, in conjunction with Crankworx Whistler. Popularity grew quickly with hundreds of pro riders and enthusiasts soon throwing down for the title of unofficial king of whips. 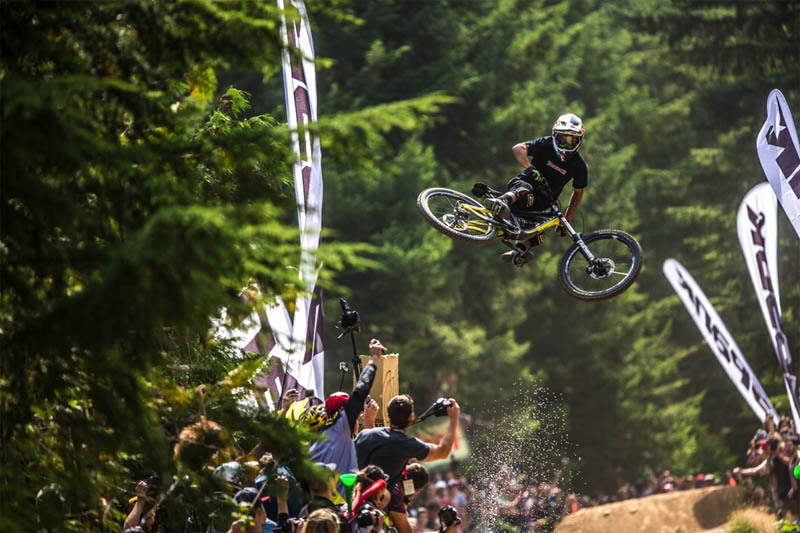 In 2013, organizers officially brought the Whip-Off under the Crankworx umbrella, and this year, the Oceania Whip-Off Championships brings the event to New Zealand, promising to take the Whip to new levels! "We're super excited to have Spank as a continuing partner of the Crankworx Whip-Off Champs at each stop of the Crankworx World Tour. Their support has really helped to make the event super-legit with better prizing for the amateurs and, of course, has enabled us to step up prize purses." - Darren Kinnaird, Crankworx World Tour General Manager. "Spank Industries started with Crankworx 6 years ago. It's been amazing to watch the festivals grow year after year, on local and global scales. This will be the second year Spank supports the Official Whip-Off Championships, and we couldn't be more excited. We see the Whip Off series as a one of a kind opportunity for amateurs and pros to throw down together, in a friendly "bro-down" atmosphere. What could have been more exciting than 14 year old Finn Isles taking the title in 2014 head-to-head with the world's top athletes? This IS MTB!" - Mike Dutton, Spank Ind. Brand Manager.